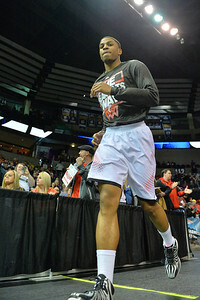 March 20, 2014: A member of the Cincinnati Bearcats takes the court before a second round game of the NCAA Division I Men's Basketball Championship between the 5-seed Cincinnati Bearcats and the 12-seed Harvard Crimson at Spokane Arena in Spokane, Wash. Harvard defeated Cincinnati 61-57. 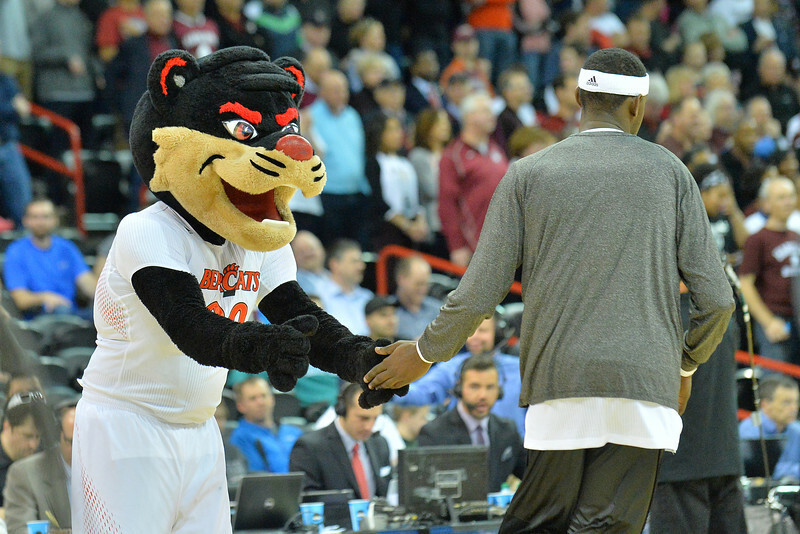 March 20, 2014: A Cincinnati Bearcats player gets stretched before a second round game of the NCAA Division I Men's Basketball Championship between the 5-seed Cincinnati Bearcats and the 12-seed Harvard Crimson at Spokane Arena in Spokane, Wash. Harvard defeated Cincinnati 61-57. March 20, 2014: A Cincinnati Bearcats cheerleader performs during a second round game of the NCAA Division I Men's Basketball Championship between the 5-seed Cincinnati Bearcats and the 12-seed Harvard Crimson at Spokane Arena in Spokane, Wash. Harvard defeated Cincinnati 61-57. 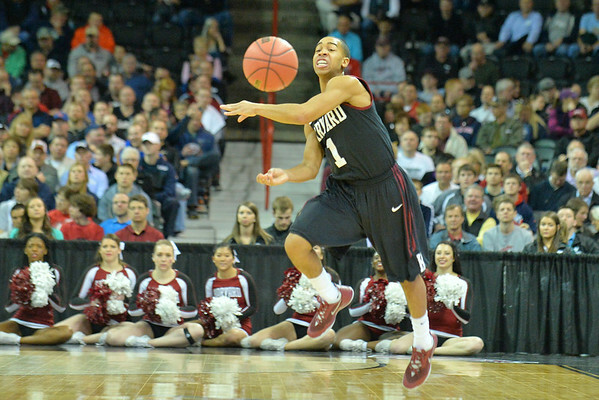 March 20, 2014: during a second round game of the NCAA Division I Men's Basketball Championship between the 5-seed Cincinnati Bearcats and the 12-seed Harvard Crimson at Spokane Arena in Spokane, Wash. Harvard defeated Cincinnati 61-57. 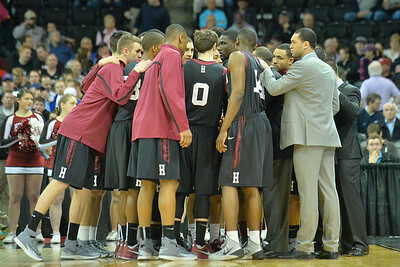 March 20, 2014: The Harvard Crimson team huddles before the tip-off a second round game of the NCAA Division I Men's Basketball Championship between the 5-seed Cincinnati Bearcats and the 12-seed Harvard Crimson at Spokane Arena in Spokane, Wash. Harvard defeated Cincinnati 61-57. March 20, 2014: Harvard Crimson forward Kyle Casey (30) chases down a loose ball during a second round game of the NCAA Division I Men's Basketball Championship between the 5-seed Cincinnati Bearcats and the 12-seed Harvard Crimson at Spokane Arena in Spokane, Wash. Harvard defeated Cincinnati 61-57. 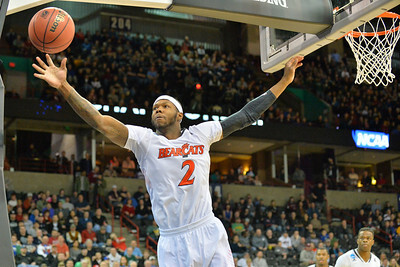 March 20, 2014: Cincinnati Bearcats forward Titus Rubles (2) grabs a rebound during a second round game of the NCAA Division I Men's Basketball Championship between the 5-seed Cincinnati Bearcats and the 12-seed Harvard Crimson at Spokane Arena in Spokane, Wash. Harvard defeated Cincinnati 61-57. 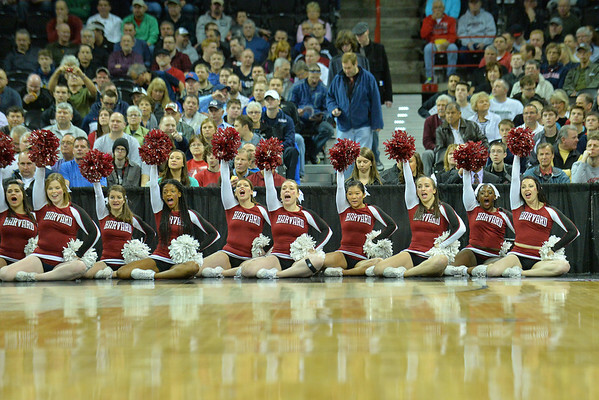 March 20, 2014: The Harvard Crimson cheerleaders perform during a second round game of the NCAA Division I Men's Basketball Championship between the 5-seed Cincinnati Bearcats and the 12-seed Harvard Crimson at Spokane Arena in Spokane, Wash. Harvard defeated Cincinnati 61-57. 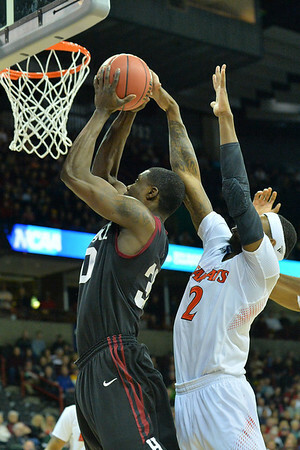 March 20, 2014: Cincinnati Bearcats forward Titus Rubles (2) blocks a shot during a second round game of the NCAA Division I Men's Basketball Championship between the 5-seed Cincinnati Bearcats and the 12-seed Harvard Crimson at Spokane Arena in Spokane, Wash. Harvard defeated Cincinnati 61-57. March 20, 2014: Harvard Crimson guard Siyani Chambers (1) passes the ball on a fast break during a second round game of the NCAA Division I Men's Basketball Championship between the 5-seed Cincinnati Bearcats and the 12-seed Harvard Crimson at Spokane Arena in Spokane, Wash. Harvard defeated Cincinnati 61-57. March 20, 2014: Harvard Crimson forward Kyle Casey (30) gets into the paint during a second round game of the NCAA Division I Men's Basketball Championship between the 5-seed Cincinnati Bearcats and the 12-seed Harvard Crimson at Spokane Arena in Spokane, Wash. Harvard defeated Cincinnati 61-57. March 20, 2014: Harvard Crimson forward Kyle Casey (30) goes up for a dunk during a second round game of the NCAA Division I Men's Basketball Championship between the 5-seed Cincinnati Bearcats and the 12-seed Harvard Crimson at Spokane Arena in Spokane, Wash. Harvard defeated Cincinnati 61-57. March 20, 2014: Harvard Crimson forward Kyle Casey (30) dunks during a second round game of the NCAA Division I Men's Basketball Championship between the 5-seed Cincinnati Bearcats and the 12-seed Harvard Crimson at Spokane Arena in Spokane, Wash. Harvard defeated Cincinnati 61-57. March 20, 2014: Cincinnati Bearcats forward Shaquille Thomas (3) shoots over Harvard Crimson guard Laurent Rivard (0) during a second round game of the NCAA Division I Men's Basketball Championship between the 5-seed Cincinnati Bearcats and the 12-seed Harvard Crimson at Spokane Arena in Spokane, Wash. Harvard defeated Cincinnati 61-57. 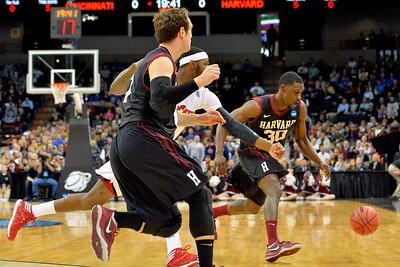 March 20, 2014: Harvard Crimson forward Kyle Casey (30) looks to pass inside during a second round game of the NCAA Division I Men's Basketball Championship between the 5-seed Cincinnati Bearcats and the 12-seed Harvard Crimson at Spokane Arena in Spokane, Wash. Harvard defeated Cincinnati 61-57. 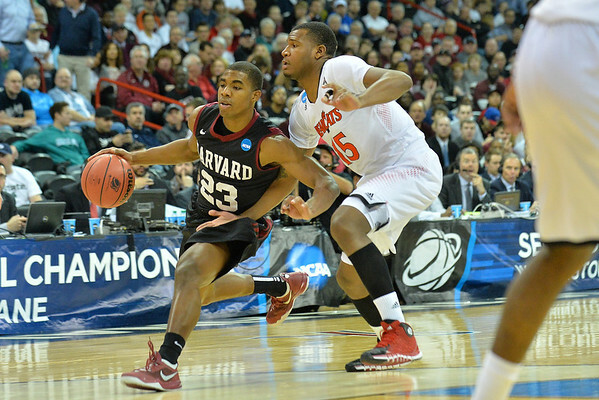 March 20, 2014: Harvard Crimson guard/forward Wesley Saunders (23) drives past Cincinnati Bearcats forward Jermaine Sanders (15) during a second round game of the NCAA Division I Men's Basketball Championship between the 5-seed Cincinnati Bearcats and the 12-seed Harvard Crimson at Spokane Arena in Spokane, Wash. Harvard defeated Cincinnati 61-57. 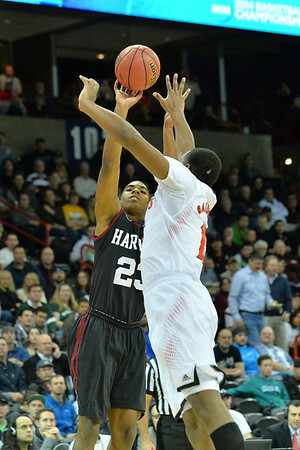 March 20, 2014: Harvard Crimson guard/forward Wesley Saunders (23) shoots over Cincinnati Bearcats forward Jermaine Sanders (15) during a second round game of the NCAA Division I Men's Basketball Championship between the 5-seed Cincinnati Bearcats and the 12-seed Harvard Crimson at Spokane Arena in Spokane, Wash. Harvard defeated Cincinnati 61-57. 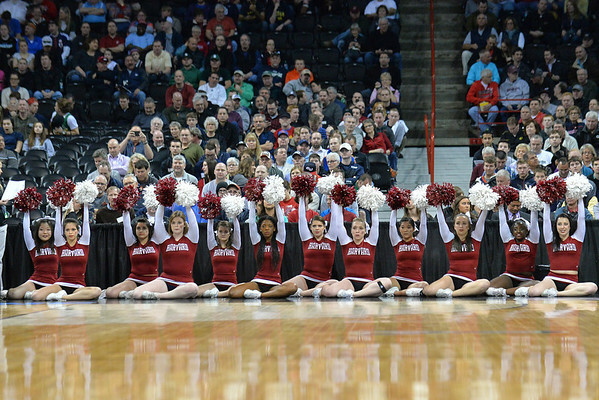 March 20, 2014: Harvard Crimson cheerleaders raise their pons during a free throw during a second round game of the NCAA Division I Men's Basketball Championship between the 5-seed Cincinnati Bearcats and the 12-seed Harvard Crimson at Spokane Arena in Spokane, Wash. Harvard defeated Cincinnati 61-57. 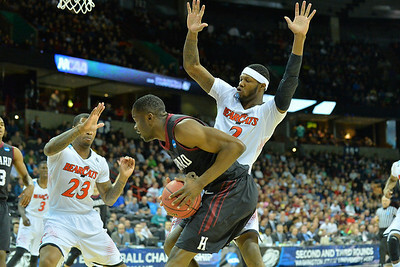 March 20, 2014: Harvard Crimson guard Brandyn Curry (10 defends Cincinnati Bearcats forward Shaquille Thomas (3) during a second round game of the NCAA Division I Men's Basketball Championship between the 5-seed Cincinnati Bearcats and the 12-seed Harvard Crimson at Spokane Arena in Spokane, Wash. Harvard defeated Cincinnati 61-57. March 20, 2014: Harvard Crimson guard Siyani Chambers (1) looks to get inside during a second round game of the NCAA Division I Men's Basketball Championship between the 5-seed Cincinnati Bearcats and the 12-seed Harvard Crimson at Spokane Arena in Spokane, Wash. Harvard defeated Cincinnati 61-57. 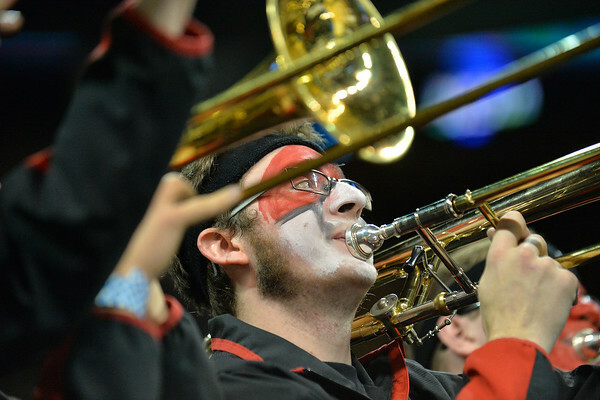 March 20, 2014: A member of the Cincinnati Bearcats pep band plays during a second round game of the NCAA Division I Men's Basketball Championship between the 5-seed Cincinnati Bearcats and the 12-seed Harvard Crimson at Spokane Arena in Spokane, Wash. Harvard defeated Cincinnati 61-57.